Don’t you hate having to remove the drip tray to get your travel mug under your Keurig machine? A while back, a long while back, I realized this was a problem when I got my first Keurig and my favorite mug, my Thermos Stainless King, was to tall to fit under it. Fast forward to today and now I have a ton of options that fit under Keurigs. I even have some mugs that will fit under the Keurig mini! If you are looking to find a Keurig sized travel mug then you’ve found the guy that can help you. For starters you can just scroll down this page a bit to see a few options or click through to this page to see the shortest of all the mugs, each of which is small enough to fit under the mini or other Keurig machines without having to remove the drip tray. Can You Fit a Travel Mug Under a Keurig Coffee Machine? I’ve got a lot of good travel mugs and a few good thermal desk mugs too. One of the most notable features of them all with some small exceptions is that they are all fairly tall and narrow as they are designed to hold a good deal of coffee and yet still fit into standard cup holders and bottle pouches. For those of you who have or who are thinking of picking up a Keurig coffee maker you should know that many thermal coffee mugs and tumblers will not fit under the Keurig machines. Even with the drip tray removed and the lid removed from many travel mugs they are simply too tall. This isn’t really their fault either as Keurig machines are designed to brew small batches of coffee – much smaller than the capacity of the most common sized travel mugs 14-20oz. There are however a number of quality travel mugs that are short enough to work with Keurig machines. Most of them require the removal of the drip tray on the machines but they do work. KeepCup makes some nice super-small travel mugs that are perfect for Keurig coffee makers. They are sized perfectly and look pretty cool too. If you want a high performance travel mug however you’ll have to go to Contigo which has partnered with Keurig on a mug that is “designed” specifically for the Keurig machines. It’s basically a small version of their very popular Auto-seal line of travel mugs. Basically it’s still too big for most Keurig portions in my opinion but it is a really good mug and worth checking out. To compliment this page let me point you towards this post will help you find a bunch of small insulated mugs that would be perfect for Keurig machines. 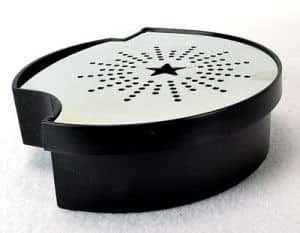 If you have a Keurig – or are buying a gift for someone with a Keurig machine – this page will be helpful in finding a good mug sized appropriately for all the Keurig coffee makers, Keurig mini included. You may also want to see this page which features insulated espresso cups, some of which are big enough for a small cup of coffee. K-cups had been a craze in the coffee world. It is created by Keurig and it features ready-made coffee in pods or capsules. What people love about Keurig is the convenience and variation it offers. While coffee aficionados do not always agree whether Keurig is good coffee or not, the fact remains that Keurig offers a convenient way of making brewed and flavored coffee with just one push of a button. Keurig machines are designed to quickly brew not only coffee but tea, hot chocolate, iced coffee and a variety of other hot beverages. The grounds are pre-measured into the K-Cup or Vue Cup, which are small pods. The machine delivers your selected brew within 20-60 seconds. The single pod must then be discarded, it is not good for more than one use. 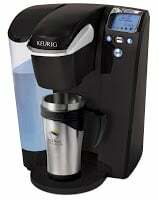 There are many models of the Keurig, ranging from the “Mini-Keurig” to the “Keurig Vue”. Picking the right one all depends on how often you will be using your machine. Each water reservoir size is different, and each machine comes with different options. Because Keurig coffee is such a nice machine, coffee lovers want to keep in a travel mug and bring it at work. Keurig is a small machine and not all travel mugs will fit in it. 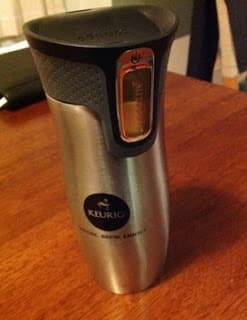 How can you find a travel mug that fits your Keurig machine? As a rule of thumb, Keurig spout and the plate is approximately 5 ½ inches tall. If you need a travel mug, make sure that it is at most 5 inches tall. You can get a 6-inch tall but make sure that the lid is removable. In terms of ounces, travel mugs that range from 8 oz to 12 ounce are better options for travel mugs that will fit under a Keurig. KeepCup does not retain hot drinks as long as the Klean Kanteen but it can keep your coffee warm for an hour, at most. You can enjoy your coffee in this insulated mug and bring it along when you travel. It has leak-proof lid and easy to drink opening. It’s also super easy to clean. Stanley brand is favorite household name. This 8 ounce mug is no stranger to the good benefits of owning a Stanley. Hamilton is another popular kitchen brand that delivers quality products that are practical, easy-to-clean and nice-looking. It is a great partner for professionals because of its nice cushioned pad and no-spill, leak-proof feature. Users love the push button lid because it allows them to use the Contigo travel mug with just one hand. It also has a lid lock feature to prevent from accidentally pushing the Autoseal button. Klean Kanteen has new models featuring wider bottles for easy cleaning and just the right height for users who have Keurig single serve. They can brew directly to the mug and bring it along wherever they go.